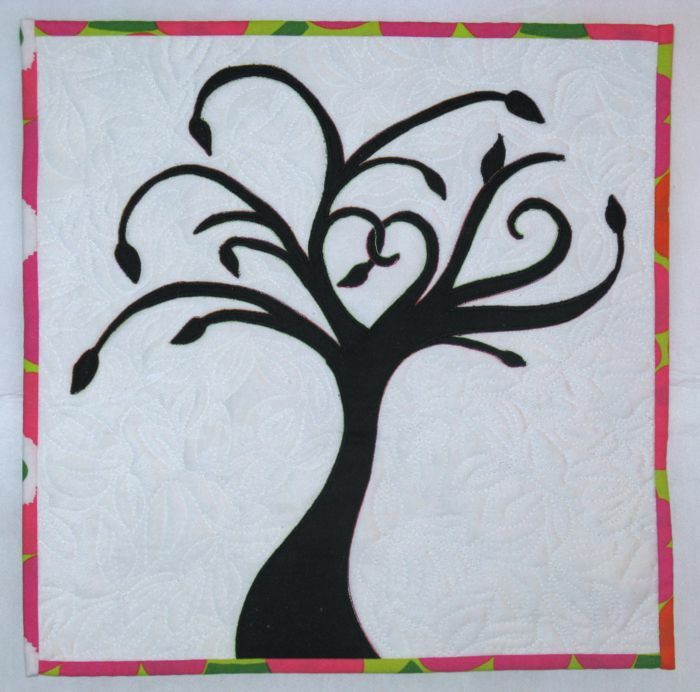 One Black Leaf | OccasionalPiece--Quilt! 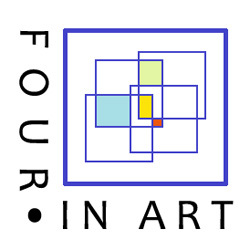 Posted on February 1, 2013 by Elizabeth E.
This is our second round of our art group, self-titled Four-in-Art. Our theme was “tree” or “trees,” however the artist wanted to think about it. I call this “One Black Leaf.” And as is my usual, I’ll save the craft and construction details for the next post. The other artists in our group are listed below, and are also revealing their quilts today, too. I’d encourage a visit to see how they interpreted the theme. I remember talking with an arborist in Washington DC once, about how dead trees looked in winter–nothing blossoming, nothing growing, the bare branches stretched to the sky. She smiled as I went on and on, then said “Oh, they’re full of life, all right. You just can’t see it.” I thought of her remark often as I walked the National Mall that winter, admiring the trees’ scaffolding revealed by fallen leaves, those graceful branches stretched out above the cold ground. So I chose to combine a photo I saw of an espaliered tree–a tree that was trained into an arranged shape by the hand of man and which had a heart at the center of it–with a drawing of a tree that looked to me like it was in motion, was half-tree/half-vine. I liked the look of the drawing, how it wasn’t static, wasn’t near death, even though it had plenty of black leaves on it. Since I am not a trained artist, I have to start from a reference point. And sometimes that reference point is an idea, a range of experiences, a poem about one black leaf. It’s just lovely Elizabeth. Your tree does look full of life, the heart is a perfect touch. Very nice! I love the simplicity of the color; black and white, with the graceful and complex tree. Very well done. The color binding is a nice pop. I remind my kids all the time during winter that the trees aren’t dead, just waiting. 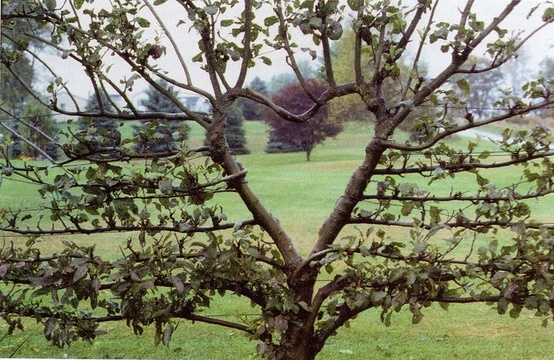 Really like your tree – and your thoughts on life (and death). Felt the same when we left my Mom’s in January. But I keep reminding myself it will be a door to another life. Love your “One Black Leaf”! It’s beautiful!! Trees and high contrast are two of my favorite concepts in art quilting. Elizabeth, I just love the vibrancy of this – it’s happy and mellow all in one. And I would never have guessed this was coming from the black spiral of fabric – never! This Four-In-Art experiment is fascinating to me. It’s interesting, the juxtaposition of the notion of death and one black leaf against such a bright white background and colourful binding. What could potentially be ominous in tone has a totally different energy, especially since the tree itself has such clean, smooth lines. The tree could have easily become “halloween-y”, ragged and dead, but the polished curves and bud-like leaves make it vibrant and alive. Lovely piece, and I appreciate your reflections on it. A lovely piece of work and a thought provoking post that made me think instantly of images of trees ravaged by bush fires in Australia, and how quickly they re-generate.